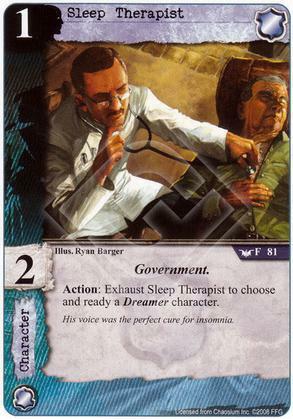 Flavor Text: His voice was the perfect cure for insomnia. Good skill for the cost and an easy pick for an agency deck with dreamers. Otherwise, ignore. Agency Don't have enough dreamers to make the ability worthwhile but they do have an abundance of 1 cost characters. This won't make the cut in most decks but if you wanted to make a 1 cost agency deck he fits in nicely. You can always make a character a dreamer using Ancient Zoog (ItDoN).